TrimIt Dry1000 Dry Trimmer - ON SALE! - FREE Shipping! TrimIt Dry1000 is the next evolution among a generation of high volume dry trimmers. It's proven design and high quality materials combine to deliver higher quality trimming to your harvesting project. The stainless steel exterior provides a clean look in addition to durability for outdoor use. Double plexi shields with magnets ensure that the user remains safe during operation. Built in timer allows you to set the amount of time you wish to trim your plant material and when the timer turns to 0 the unit simply shuts off. Proudly manufactured in North America. 110v input power. NEW CUTTING TECHNOLOGY: This engineered polymer blade is extremely durable, corrosion resistant, has a low surface friction, and can withstand high impact. This blade also meets FDA and USDA guidelines so you can be sure your product will be trimmed safely for your consumers. Also includes a 304 Stainless Steel blade for added versatility. 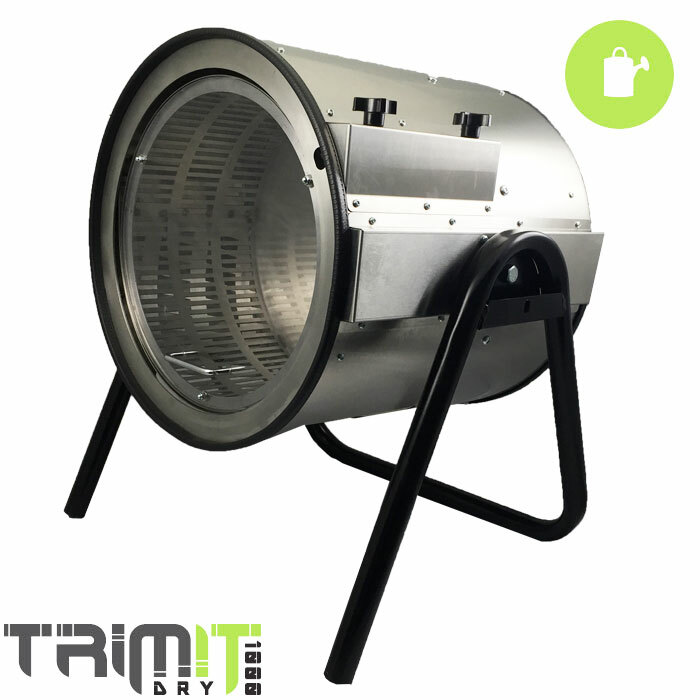 EASY TO ADJUST TrimIt Dry1000 features an 8 point adjustable tilt that makes it easy to adjust for optimal tumbling and the perfect trim. The removable barrel gives users the ability to clean the entire unit quickly and easily.